Carnivals are occasions for merrymaking and enjoyment. To be curbed by any kind of restrictions will spoil the fun. 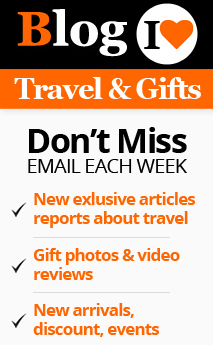 This is where a Venetian mask comes in handy. Veiled by the anonymity provided by these masks, you can take advantage of the carnival ambience to the maximum. There is a plethora of Venetian masks to choose from. You may choose the one that serves your purpose. 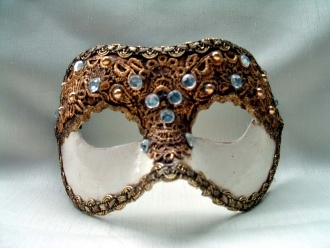 You can either wear a Venetian full face mask, thus hiding your personality completely or wear a Venetian half-face mask that leaves the on lookers in doubt and confusion as to your identity. But if you are a beautiful lady, you may not want the mask to obscure your entire face. In that case you can use the wand mask. Hold it in your hand just hiding the upper part of the face exposing your beautiful eyes framed by some charmingly glamorous design. The viewers will be greatly intrigued, when they think that they recognize you, but not completely. 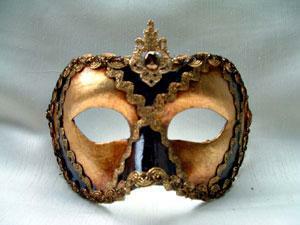 Our Arlecchino flame half mask has a mysterious quality of its own. The magnificent flame crest of the mask renders it a most enigmatic form. You are sure to stand out in the crowd. You can enjoy admiration without actually compromising your anonymity. The advantage is all yours! The Venetian Colombina masks are usually half masks which were introduced by a beautiful actress of that name in the 16th century. Being extremely beautiful herself, one can understand her desire not to cover her entire face. The masks are extremely decorative. These Venetian carnival masks are embodiments of elegance and beauty. 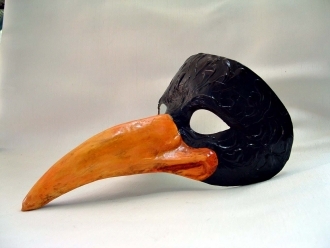 In one of our jolly masks you will look exceedingly merry and decorative. 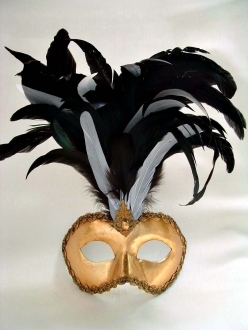 Just by wearing one of these masquerade masks, you will immediately be thrown into the jolly mood of a carnival. You are transported back to the good old days of exuberant masquerades with their kings, queens and nobles. The striking full face feather masks are a sight to see. If you want to be particularly conspicuous at the Mardi Grass carnival wear one of our elaborate and brightly colored full face feather masks. People will form a beeline to be introduced to you because you become highly intriguing and people are always attracted by intrigues. So give it to them! 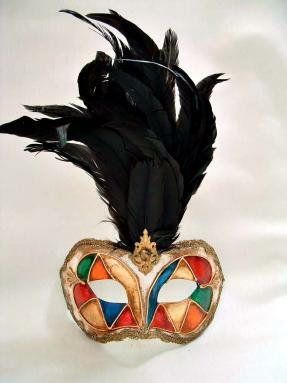 Galletto half face Mardi Grass masks are spectacular in their appearance. When you wear one of these dazzling works of art, your presence will not go unnoticed. These hand-crafted masks are created by artists who possess centuries-old hereditary know-how in making masks. That is the reason why these Venetian masks have an astonishingly dramatic quality about them. You will undoubtedly be the star of Mardi Grass, if you choose to put on a galletto mask with a tuft of most eye-catching plumes. 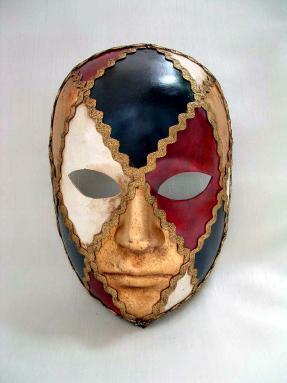 Venetian masks are connected closely with the tradition of Venice. The once worn-everyday mask now is worn only on carnivals. 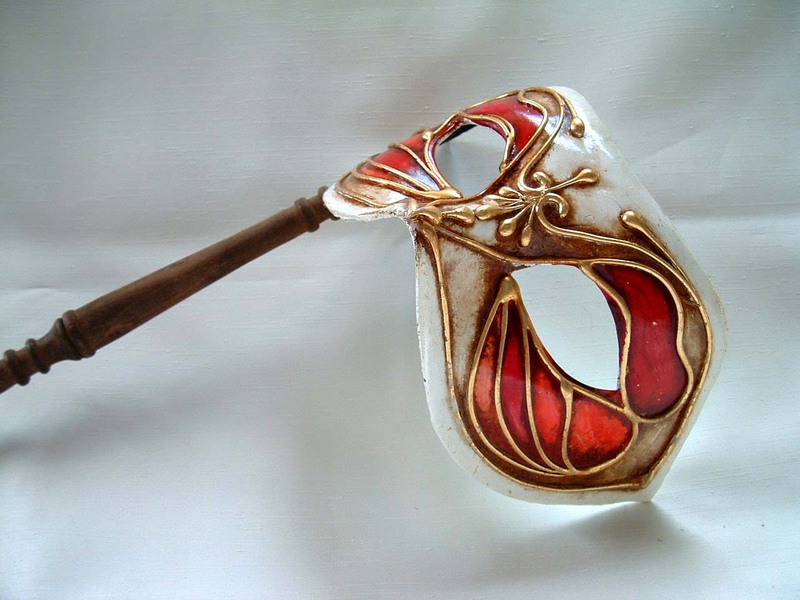 Even then these Venetian carnival masks have a high significance as far as Venice is concerned and they have become an indispensable item in the collection of any hobbyist.